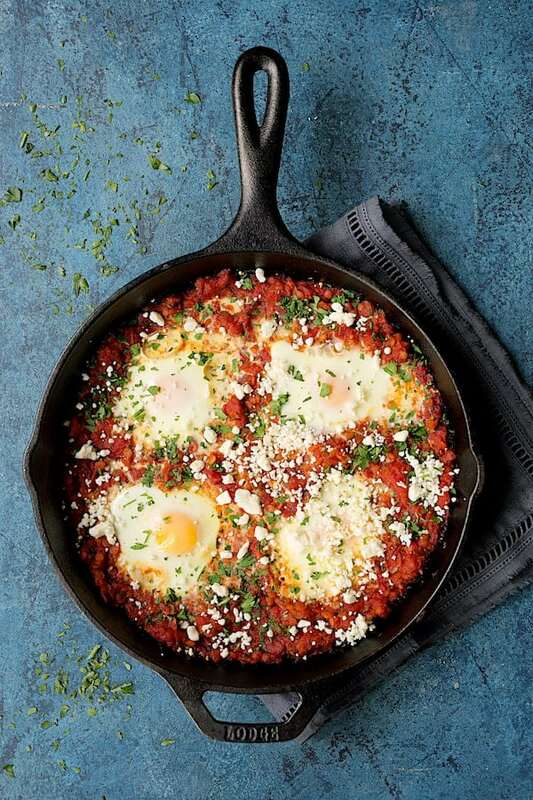 Shakshuka with Red Lentils and Feta Cheese is a heartier twist on traditional shakshuka. Red lentils are smaller than conventional brown or green lentils so they cook faster for a skillet meal that’s perfect anytime! Every so often, a traditional dish a culture or numerous cultures have been making for forever catches on worldwide. Shakshuka is one of those dishes. Seems shakshuka recipes are everywhere! Shakshuka (also spelled shakshouka) is a dish of eggs poached in a spicy tomato sauce. The exact origin is unknown, but it’s from the Mediterranean and Middle Eastern region which encompasses many countries. Italians call their version, Eggs in Purgatory. Although it has many variations, the typical shakshuka always has tomatoes, some form of chili pepper, garlic and spices. 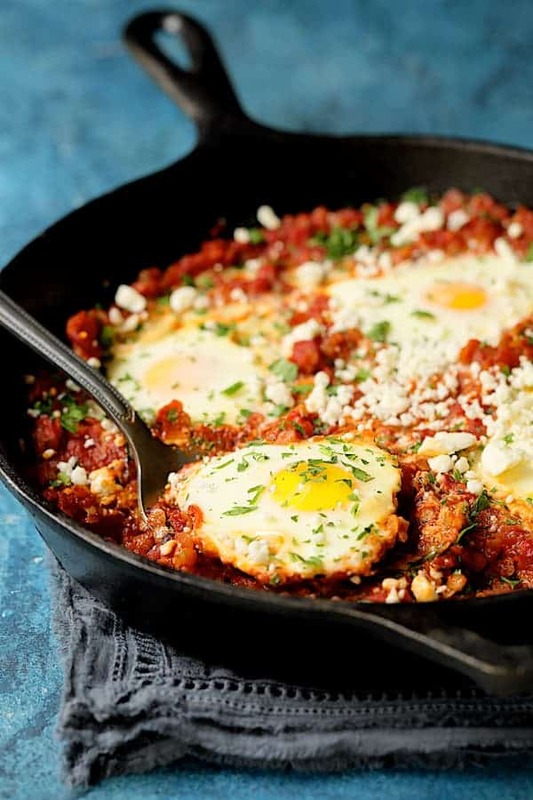 Because it’s so saucy, a typical shakshuka is served with lots of warm pita bread on the side. I’ve wanted to make shakshuka for a while now to find out what the buzz is all about. And yes, friends, it’s worth the buzz! Once you make it, you’re hooked! Start with a good, heavy skillet–stainless steel or cast iron. A thin-bottomed skillet can cause the tomatoes to burn. IMPORTANT: Only use a cast iron skillet if it’s well-seasoned. If it’s a new skillet, the acid from the tomatoes can strip the light layer of seasoning and you’ll end up with a metallic taste. I find every excuse on the planet to pull out my cast iron skillet so I felt confident it would work here and it did; my seasoning was not affected with no hint of metal. 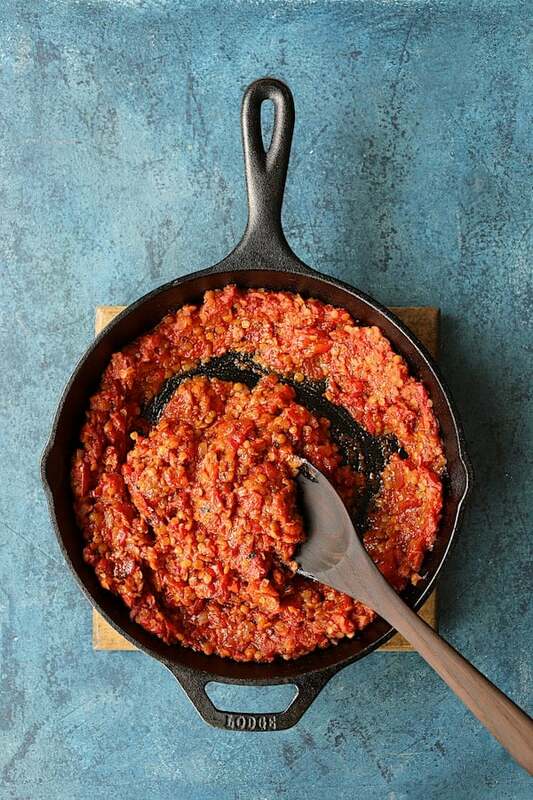 Here’s more information on using a cast iron skillet with tomatoes from The Kitchn. Cook onions and a red Fresno chili pepper until soft. Add a chopped roasted red bell pepper (from a jar) and some garlic, crushed fire-roasted tomatoes, spices and uncooked red lentils. Simmer covered until the lentils are soft. Cook covered until the eggs are just set…. Sprinkle with chopped parsley and feta cheese and mwaaahhhhh! 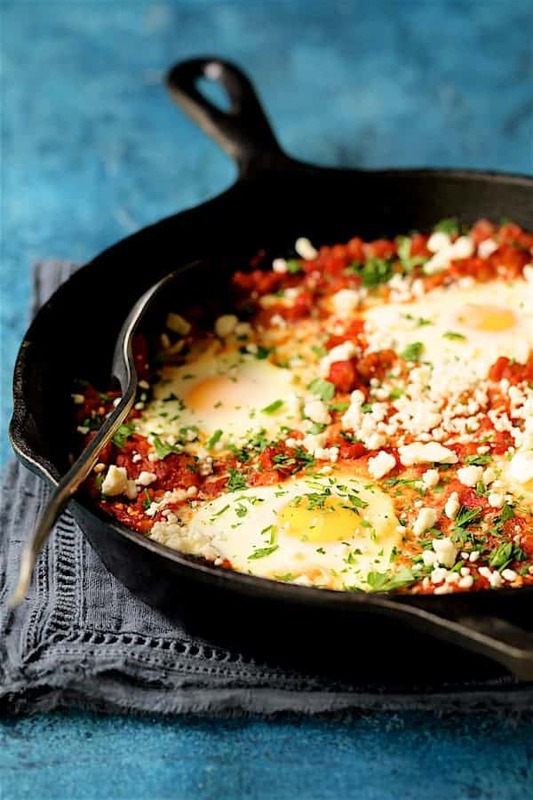 Shakshuka with Red Lentils and Feta Cheese! Because the lentils add body to the sauce, you can skip all that pita bread if you’d like and it’s hearty enough for dinner! Add spinach, kale, chard or any leafy green. Throw in some cooked, diced potatoes. Add cooked sausage such as chorizo, kielbasa, andouille or Italian. Now let’s eat! 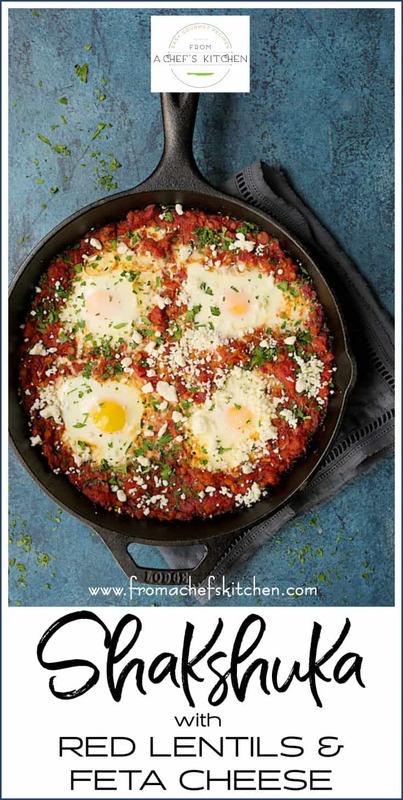 Shakshuka with Red Lentils and Feta Cheese! Soooo good! 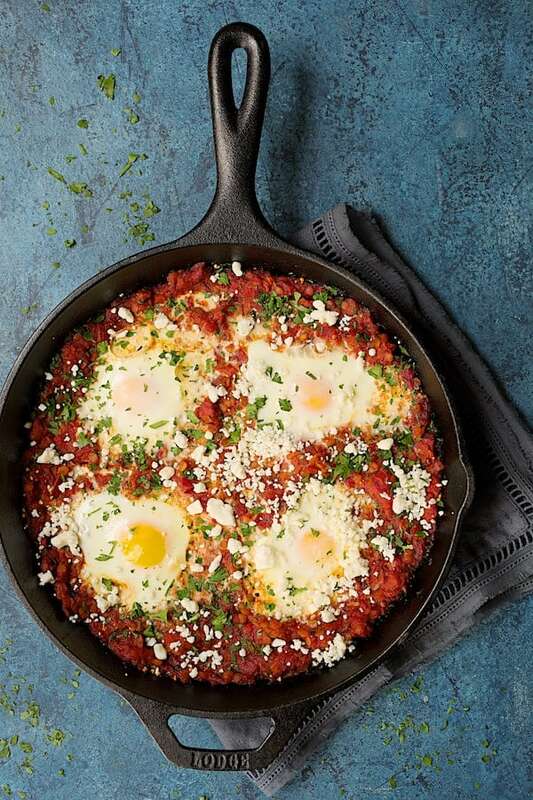 Shakshuka with Red Lentils and Feta Cheese is a heartier twist on traditional shakshuka. Red lentils are smaller than conventional brown or green lentils so they cook faster for a skillet meal that's perfect anytime! Heat oil over medium-high heat in a heavy skillet such as cast iron. Add the onion and chile, reduce heat to medium-low and cook 5-6 minutes or until soft. Add the roasted red bell pepper and garlic. Cook 30 seconds or until garlic is fragrant. Add tomatoes, cumin, paprika, cayenne and lentils. With the back of spoon, press to create 4 wells in the tomato-lentil mixture. Carefully crack an egg into each well. Cover the skillet and cook 7-8 minutes or until eggs are just set. Sprinkle with parsley and feta cheese. Serve immediately. TOMATOES ARE AN ACIDIC FOOD. 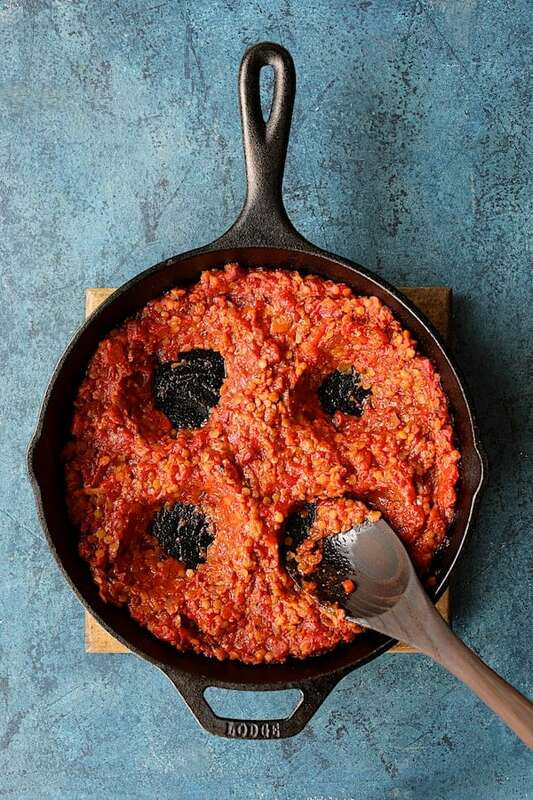 ONLY USE CAST IRON WITH TOMATOES IF YOUR PAN IS WELL-SEASONED.